Identification cards are available for any person in your system with the student, staff, or faculty roles. You can use Populi's built-in ID card or you can set up custom ID card templates in Admin. The built-in ID card templates include the person's name (last, first), ID photo, the type of ID (Library Patron, Student, Faculty, or Staff), the current calendar year, and a barcode. Your school's name and logo are not included. Custom ID cards let you add school logos; various options for name, year, and student info; and custom information fields. Any ID card with a barcode doubles as a library card in Populi Library. Populi comes with several types of built-in templates. You can view them all in Admin > ID Card Templates. Each type includes a Nine per page version that lets you print ID cards in bulk. Click Add an ID Card Template (bet you didn't see that coming). Select the template type. This determines what kind of ID card someone can produce for a given user. For example, if you choose Faculty, that template can only be used to generate ID cards for users with the Faculty role. Choose Other for things like library cards. Your new template will be created with the page layout dimensions described below. To set up a custom template, you can add a new one and start working on it or modify one of the built-ins. The single-card templates are 3.37 inches wide by 2.125 inches tall. The nine-per-page templates get you nine cards of the above dimensions from an 8.5" x 11" sheet. There are three rows and three columns; a top margin of 1 inch and a left margin of 0.225 inches; and a space between columns of 0.2 inches. These dimensions determine where your printer will lay down the ink. Say you got rid of that 1-inch top margin: every ID card you print onto an 8.5" x 11" sheet would be positioned an inch off. ID card fields are the blocks of resource information included on each ID card. These items have to be arranged so that they fit on one, single printed ID card. 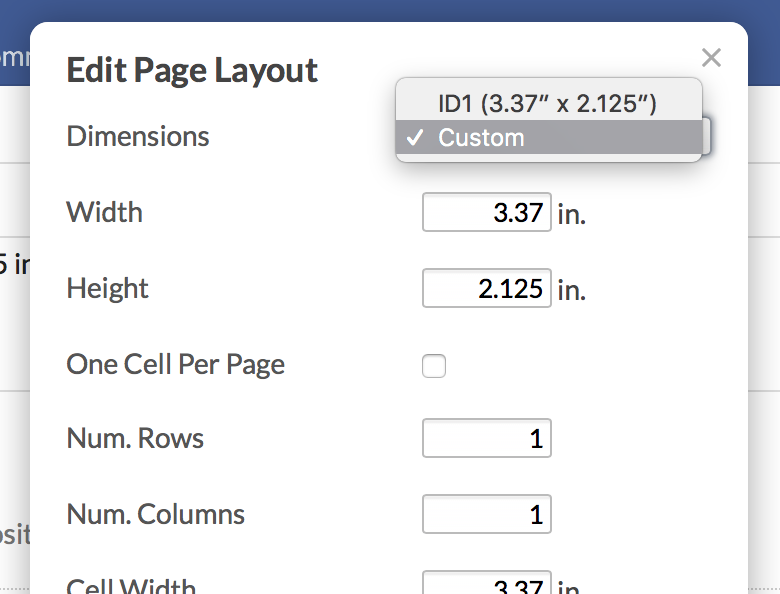 Should you want to, here's how to edit the page layout dimensions. Enter or edit values for the fields you need to change. The cell width and height determine the overall dimensions you'll be using for your ID card fields. If this is a template for a sheet of ID cards, uncheck one cell per page. This will toggle fields for the dimensions of rows and columns. ID card fields let you specify the ID card's content and appearance. You can add a new field and design it from scratch. You can also edit an existing field by clicking edit or hovering over the preview and clicking the highlighted field. Here's how to add a new field; starting at step 3, the instructions also work for editing an existing field. Choose what kind of field this is. You can only have one barcode, ID photo, or background image field per ID card template. Barcodes contain the person's Populi ID. Among other things, barcodes let an ID card double as a library card. ID Photo fields automatically import the person's profile picture. Background image fields ask you to upload a file. Enter your content. You can include variables like name, academic info, custom info, etc. You can also type text. Format the content with font size, color, and alignment. Top: Your first ID card field should probably be at 0 inches; subsequent fields should take into account the height(s) of the previous fields. A good rule of thumb: add the height and position top of the previous field(s) to get the minimum position top for your new field. As you save your ID card fields, you'll see a preview in the right column. Provided your monitor is not set up with some strange configuration, the preview is roughly the size of the actual printed ID card. The preview will help you make tweaks and adjustments to your ID card fields and their positions relative to one another. Click Print Preview to test your ID card template. Clone ID card lets you create a new ID card template based on the one you're working with.